It's the third Wednesday of the month...and it's time for PiTCC's Favorite Dishes from Around The World! Today, I am sharing with you a dish from the Japanese Cuisine which Ryan and I really like. I am not sure if I have told you before that Ryan worked with a Japanese company right after we passed the engineering board exam until he left for the US. He had been on several job related trips to Japan ranging from one to six months, which made him love everything about Japan most especially its friendly people, its fascinating state of the art railway system, the heated toilet seats (LOL), the huge electronic stores in Akihabara and its cuisine, of course. Though I haven't been to Japan myself (except for those stop overs in Narita Airport on the way to and from the Philippines), I have come to love Japanese food mainly because I have been influenced by Ryan. When we were still in the Philippines, we regularly ate at Japanese restaurants in the Makati area like Saisaki, Sakura, Jipan, Tokyo Tokyo, Yoshinoya and Teriyaki Boy. Gyudon, Katsudon, Tendon, Unagi Don, Takoyaki and Yakisoba became my favorite Japanese food among many others. But our featured dish for today is something that we got to eat not from a restaurant but from several parties hosted by Ryan's Japanese boss. It's called Nikujaga which is basically a dish with meat, potatoes and onions stewed in sweetened soy sauce. It has been years since we last had this dish. Just like in the Philippines, it's not in the menu of the Japanese restaurants we've been to here in Texas. I've tried cooking it before but I don't think it came out as authentic as it should be...there seem to be some flavors missing. I'm truly glad that through my good friend Nami, I can share with you this simple but really delicious dish and we can all learn the authentic way of cooking it. I'm sure most of you know Nami...but for those who don't, well, let me tell you that she's one of my favorite bloggers. She was born and raised in Yokohama, Japan and now lives in SF Bay Area with her Taiwanese husband and two adorable kids. She's the author and co-founder of this blog called Just One Cookbook where you can find the most authentic Japanese recipes and cooking tips. I'm truly glad to have known her! With a husband like mine who loves Japanese food so much, having Nami and her blog is truly a big help! And today, I'm so honored to have her here on PiTCC! Without further ado, let me bring you our second guest blogger for PiTCC's Favorite Dishes from Around The World series...Namiko Chen!!! Hi everyone! My name is Nami and I am the author, cook, and photographer behind my blog, Just One Cookbook where I share quick and easy Japanese food and recipes. I’m really excited to be here today to share with everyone Tina’s favorite Japanese meal, Nikujaga. Nikujaga (Japanese: 肉じゃが) literally means “meat and potatoes”, from two of the main ingredients niku (meat) and jagaimo (potatoes). It’s the Japanese version of beef stew; however, it contains a fairly small amount of meat. The meat is added for flavor rather than substance, just like most of Japanese cooking. It is simmered in the classic Japanese seasonings of soy sauce, sake, mirin, and sugar. 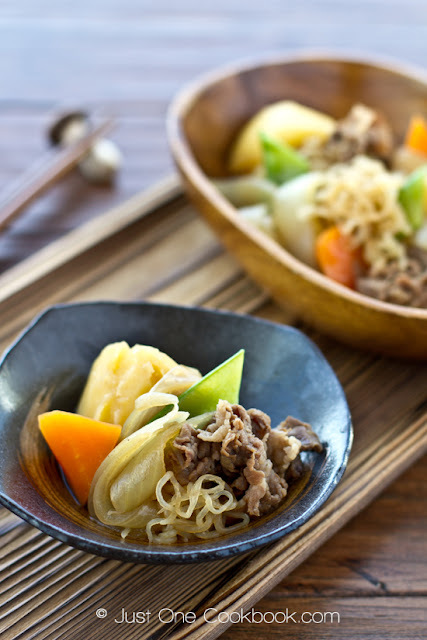 Unlike Western stews, the simmering time is much shorter because nikujaga uses thinly sliced meat. Beef is commonly used for this dish but in eastern Japan, pork is more popular. 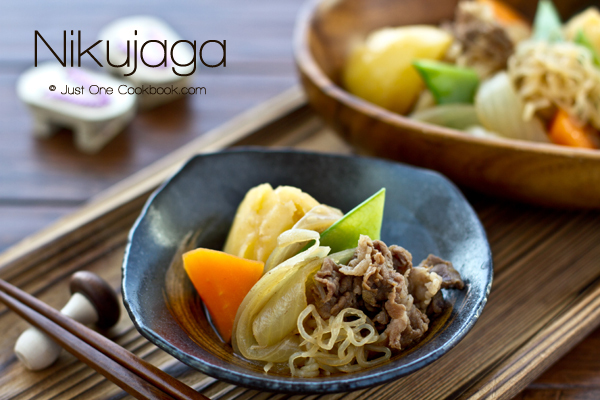 Nikujaga is a comfort food for the Japanese and it is a very popular meal cooked at home. It is often considered as “mother’s taste” meal (“ofukuro no aji” in Japanese) as each household cooks it just slightly different. The food itself is very simple and homely, and the warm bowl of your mother’s nikujaga brings one back to their roots. It is probably the most popular dish among all kinds of nimono (Japanese stewed dishes). Thank you Tina for having me here today and I hope you and your readers will enjoy this dish! Now let’s get cooking! A couple of snow peas/green beans/green peas for decoration, accenting green color. 2. Cut the onion into 10-12 wedges. Peel and cut the carrot lengthwise in half and chop into rolling wedges. 3. Cut the potatoes into 4 wedges and smooth the edge of potatoes. If the pieces have sharp edges then they are likely to break into pieces during the cooking process from bumping into each other. We call this Japanese cutting technique mentori. Soak the potatoes in water to prevent from changing color. 4. Cut the sliced meat in half. Rinse and drain shirataki noodles. 5. Remove string from snow peas and cook them in boiling water for 30 seconds and take them out. 6. Then cook shirataki noodles in the boiling water for 1 minute and cut in half. 7. In a large pot, heat oil on medium heat and sauté the onion. 8. When the onion is coated with oil, add the meat and cook until no longer pink. 9. Add the potatoes, carrots, and shirataki noodles. 10. Add dashi stock and Seasonings bring to a boil. 11. Once boiling, turn down the heat to medium and skim off the scum. Make sure all the ingredients are flat and most of ingredients are covered by the soup. 12. Place otoshibuta and simmer on medium heat for 10-15 minutes, or until vegetables are cooked. 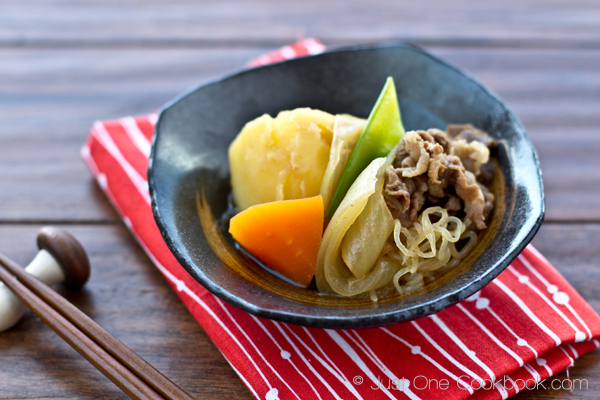 Otoshibuta is necessary to maintain the shape of the vegetables being stewed. Do not mix the ingredients while cooking; Otoshibuta will help the flavor circulate automatically. 13. Turn off the heat and discard the otoshibuta. Let it stand until 30 minutes before serving. The flavors will soak into the ingredients while cooling down. If you don’t have time for this, it’s also okay. 14. When you heat it up again, pour the soup on top of the ingredients with a spoon a couple of times. Check the flavors for the last time. When it’s almost ready, toss in the snow peas to warm them up. When ingredients are heated through it’s ready to serve. Note: Nikujaga tastes even better the second day so don’t worry if you can’t finish all the food. My sincerest thanks to Nami for this very authentic Nikujaga recipe! Hope you will all try this Japanese dish...I'm telling you, you will love it! For more authentic Japanese recipes, be sure to visit Just One Cookbook! You'll be truly amaze with Nami's cooking techniques and food styling! We too simply drool over Japanese food but is always in the restaurants. The nearest I have made it the tempura which is very simple. This recipe by Nami is not one I am aware of but sure looks very nice, what more with potatoes,one of those ingredient which is a fav all the time at home. I just need to get hold of the bamboo cover and mirin before I give a hand to this recipe. I guess Nikujaga is really not commonly served in restaurants, Nava. Just like what Nami said, it is popular meal cooked at home. I am really glad that Ryan's former boss introduced us to this dish. OMG! Two of my favorite dabarkads(hang out friends)cooking together, this is exciting! Good to see you here, Nami and thank you Tina for having her. luks wonderful.....my hub vl love this deff`ly. I am truly grateful to you for sharing Nikujaga here on PiTCC! Thanks so much again, Nami! that looks simple to me.. i am going to try out your recipe.. i love carrot and potato.. yummy! thanks a lot for sharing. what a nice soup/stew- it seems so easy and yet flavorful. I will have to try this. Lovely post, Nami. I am loving the different posts you have, Tina. This is an unusual Japanese dish to me! When I was little I lived in Japan for a few years and have yet to see anything like this. It does have some great elements and I like that it is lightly seasoned. Just good healthy food! Thanks, Tina for hosting Nami today and thank you Nami for sharing your talent! I absolutely love Nikujaga! An the link to making dashistock from scratch is extremely welcome! I love eating leftover stews and that's why always make some extra. When I made miso soup few days back it tasted better next day. Your dish originally by Nami, looks good. What a yummy guest post , Tina ! The best thing about this dish is the simple ingredients and you don't have to search high and low to find it ;D Now , all I have to buy is mirin , sake and dashi stock ! hahaha Love her nail polish , too ! LOL! And this will be the first and last post which I put my nail polish! I cook everyday and nail polish doesn't last so I rarely wear it. These pictures were taken right before my Japan trip (no need to cook!)... Thanks for the compliment tho. haha! Tina, Nami is also my favorite blogger, love reading her post and recipe are really great, and I tried some of them. I learn how to wrap dumplings. Nami, you make even the quickest dishes look amazing! Thanks for the recipe. Nami, it's so nice and such a surprise to see you here! I have never heard of nikujaga and I'm glad, as always to discover a new Japanese dish. It looks fabulous! Your photos and text are as always perfect and impressive! Tina, I'm so happy to meet another fan of the Japanese cuisine and thrilled to see Nami's blog and photos here! Nami is an extraordinary person and her Japanese recipes make me want to have Japanese food every day (actually now I practically do). Tina, I am so happy to see Nami at your blog. Nami, This is such a flavorful but simple dish..and look very delicious on your pics. You did it again my friend! Tina and Nami thank you for sharing ladies! Lovely post. That looks delicious. Similar ingredients to an English stew I would make for my family - but done the Japanese way. Thanks Nami and Tina. Lovely comfort food, I am sure I will try it :) Thanks for having Nami over, I am a big fan of her tasty recipes! You both did a wonderful job, ladies! Keep the nail polish Nami, it's cute!! Great comfort food and it looks yummy. Thank Tina for inviting our dear friend here and it's a pleasure to mee you. This definitely sounds as good as it looks! Great post ladies! Am laughing: am not a meat-and-potatoes gal at all, but!! Love this simple, but no doubt, very flavoursome quick rendition of a 'boring' stew! Learned how to make dashi, everything else at home :) ! OK, OK, mirin hard to get here, so we'll go with med-dry sherry as usual! I'll try this over the weekend and, no doubt, love it - thanks :D ! Hi Nami! The dish looks wonderful. I've been making my own Dashi stock lately and have been very please with the results. This gets me one step closer to making the delicious dish you feature here. Kudos, and I will definitely be visiting your blog! Your photos are stellar! Love this post, Tina! I like anything Japanese as I've lived in Japan for a short stint & also worked in couple of Japanese firms in S'pore. Thanks everyone for the lovely comments! It was such a pleasure to have Nami share one of my favorite food with you all! I love the idea of a twist on stew. Tina good choice for your fave dish. And heated toilets, I would love one of those. Nami this is gorgeous. Really love the look of it. And how cool it tastes better the second day. I love dishes like that. I love Akihabara too! What an amazing place. The first time I visited Japan I was blown away (literally) by the heated toilet seats and fancy bottom washers and dryers. I was determined to come back and get one in Australia. Still haven't done it! Good to see you here, Nami :) This is truly home cooked food. I love shirataki noodles. Tina, looking forward to more of your Favorite Dishes from Around The World series. I love when one of my favorite bloggers features another favorite!!! This dish looks like one the whole family would love...and I'd get my fix of one of my favorite cuisines! Thanks to you both!!! Great guest post! I love the simplicity but heartiness of this dish.